We were up and out of the house pretty early this morning. I did read a few more chapters of James and the Giant Peach to the boys while they ate breakfast. While out and about today we listened to Magic Tree House books; Mummies in the Morning and Pirates Past Noon and we started The Knight at Dawn. We had a picnic along the Hodges Village Dam and met up with our homeschool group to learn all about vernal pools. I'll freely admit I had no idea what a vernal pool was when I signed us up for this trip. Armed with winter coats, hats, mittens, rain boots, etc we were all set to explore the area. 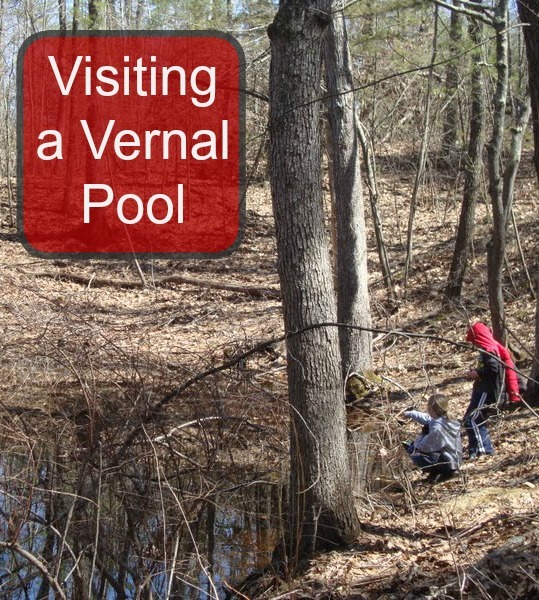 I had researched vernal pools on- line before going so I had an idea of what they were. Basically they are seasonal wetlands that show up in the fall or spring (they tend to dry up completely most summers) where frogs and salamanders come to spawn their eggs. So we were all set to wade into marshy water looking for frogs and salamanders but I must admit this trip involved so much more and totally exceeded all expectations. We were met by Ranger Jamie and taken into the welcome center. She proceeded to teach us all about vernal pools and even had a slide show. There were pamphlets, coloring sheets and all sorts of fun "stuff" for the kids to look through. All questions were encouraged and answered before we all traipsed outside to start on our walk. By this time it was getting quite nice out and the kids had started shedding coats, hats and mittens. They were running ahead of the adults, exploring nature and loving being around each other. As we approached the vernal pools we could hear the chorus of frogs-- did you know that wood frogs sound like a bunch of ducks when they're all together? I had no idea! Unfortunately, I can't get the video clip to upload to the site or else I'd share it with you all. Is this a depression in the land? Yes! Is there a place the water is coming in from or a place where it is draining out to? No! Do you see wood frogs, eggs, or salamanders? Yes! We saw eggs and frogs. Are there any fish? No! Then it's a vernal pool. Those are the defining characteristics. We learned that unlike other marshes, bogs, and wetlands vernal pools are determined by the animals found there; not the plants. We walked around the whole pool listening to the frogs, looking for frogs, eggs, salamanders and any other neat signs of nature. Ranger Jamie showed the kids how to turn over logs to look for salamanders and taught us that we can't pick them up with clean hands. Soaps, lotions and sanitizers we rely on for clean hands are poisonous to frogs and amphibians, so if we were to see any we first had to get our hands nice and dirty just like the frogs and salamanders. Unfortunately, since spring is taking it's sweet time getting here this year it's still to cold and early for the salamanders, but we did see lots of frogs. Alec wanted me to share a picture of this rock he found today he thinks it looks likes a ship and he just had to bring it home with us. We put all logs back in place after looking and then headed out of the vernal pool. We walked back to the station along another path that took us by a much larger pond. We saw both male and female mallard ducks. By then we were back at the station so we set up for a picnic/snack and played and visited with all our homeschool friends. Many of the kids that showed up for the walk are part of our normal group that gets together every other week and the kids are all becoming great friends. It was a fabulous day! We finally said our good- byes and headed to the library where the boys were overjoyed to find that another set of Magic Treehouse books on CD came in and so we took out The Knight at Dawn and started listening to Summer of the Sea Serpent. Evan surprised us all by buckling himself in! This is such a small skill but one we've all been dying for him to try and master. Today out of the blue he finally did (several times!!). And look how proud of himself he was, it was just great.